FOR IMMEDIATE RELEASE: Portland, Maine (May 18, 2018) –Earlier today, New England Fights (NEF) released the official card for its upcoming return to Aura in Portland, Maine. The mixed-martial-arts event, entitled “NEF 34: Home of the Brave,” is scheduled to take place on Saturday night, June 16, 2018 with a bell-time of 7:00 pm EDT. The main event will feature two rising East Coast prospects when Bangor, Maine’s own Aaron “Relentless” Lacey (5-1) meets Fayetteville, North Carolina’s Da’Mon “The Diamond” Blackshear (4-1) in a featherweight bout. Lacey is coming off a dominant win over veteran Josh Parker (6-9) earlier this year, while Blackshear looks to rebound from the first loss of his professional career last August. Lacey’s Young’s MMA teammate “The” Ryan Sanders (15-9) will see action in the co-main event against Tampa, Florida’s Vince McGuiness (5-7). Sanders is the reigning NEF MMA Pro Lightweight Champion. The fight with McGuiness will be a non-title affair. Rounding out the professional portion of the card will be yet another Young’s MMA competitor in the form of Carl Langston (0-1) who is scheduled to rematch The Choi Institute’s Ernesto Ornelas (3-7) in a battle of Portland fan-favorites. Langston and Ornelas initially met last month at “NEF 33” with Ornelas coming out on top via unanimous decision. Langston immediately requested a rematch blaming his performance on nerves surrounding his pro debut. Ornelas obliged and has promised to finish Langston this time out, leaving no room for question. The amateur portion of the card will be headlined by a pair of title fights. Undefeated Central Maine Brazilian Jiu-Jitsu (CMBJJ) prospect Kam Arnold (3-0) will face Michael Crespo (3-3) of First Class MMA for the vacant NEF MMA Amateur Bantamweight Championship. In the second title fight, Carlton Charles (2-1) of the Charles Fighting Family and Berserkers MMA meets Duncan “The Highlander” Smith (2-2) of Evolution Athletix to crown a new NEF MMA Amateur Welterweight Champion. 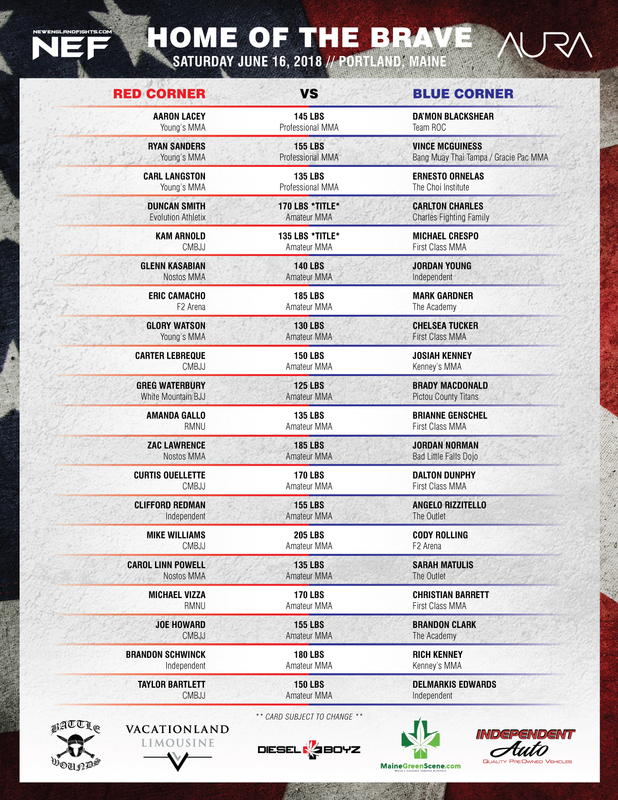 Both fights are scheduled for five three-minute rounds – a first in the NEF amateur division as all previous title fights had been scheduled for three three-minute rounds. Three women’s bouts will take place on the amateur card. Brianne Genschel (0-1) of First Class MMA and the Foundry will take on Tampa, Florida’s Amanda Gallo (1-1) while Genschel’s First Class MMA teammate Chelsea Tucker (0-2) faces the debuting Glory Watson (0-0) of Young’s MMA, and Carol Linn Powell (0-1) meets Sarah Matulis (1-0) of the Outlet. Powell owns and operates Nostos MMA of Somersworth, NH alongside her husband, UFC signee and former NEF MMA Professional Lightweight Champion Devin Powell (8-3).